Well here we are. Thanksgiving is over and we are fast forwarding to the end of another year. Frankly, I hate to wish my life away but it can't come soon enough for me. 2018 will be the year we finally move to our new home in Arizona. It has been too long in coming. 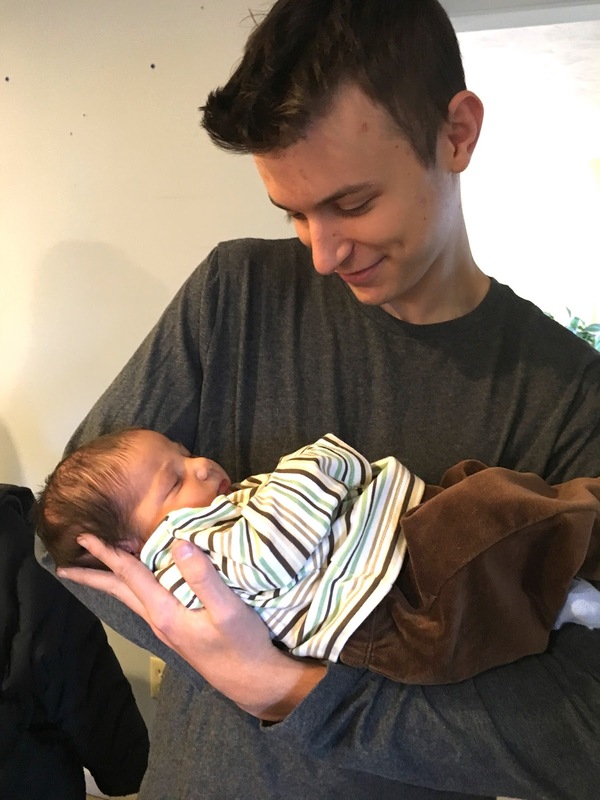 For Thanksgiving we went down to visit my son and his family and meet our new grandchild, Troy. It was so lovely and wonderful and it made me forget for a moment just how hard things have been for all of us. Just seeing my son and his growing family gave me so much joy, I was near bursting. We have all had a hard road to deal with over the past 18 years. So to see him with a lovely family now, and dogs and a house was just, well, fantastic. He made us a lovely holiday dinner and we all took turns holding the baby. Even my grandson took a turn holding the baby and it made quite a wonderful picture as you can see in the above photo. There are 18 years exactly between them as Ethan will be 18 in 6 days. It is hard for me to believe that he is so grown up. He now has an after school job at Trader Joe's and seems to enjoy that very much. Painting is still eluding me pretty much. But that is going to have to be OK for now. Well, that last line made me snicker. Please put a gun to my head before I pack for the old folks home. I do NOT want to be a minimalist. I DO NOT want one of those Tiny Houses. We had a tiny house when we got married..maybe 900 SQ FT. That was tiny to me. I never got my dream house, but I am happy with what I have. Your newest grandson is beautiful. I like the idea of minimalism and strive to live that way. It's hard, though, at times, when you want things for a certain project and activity in which you are involved. We live in a small house so I don't shop at Costco! Nothing new comes in unless something old goes out.